I realized my last few posts I’ve used the old hang-the-quilt-on-the-door trick….but when the sun comes out in Seattle all of my quilt holders seem to be gone! Someday I will miss all of the dirty little hands in my house right? RIGHT?? 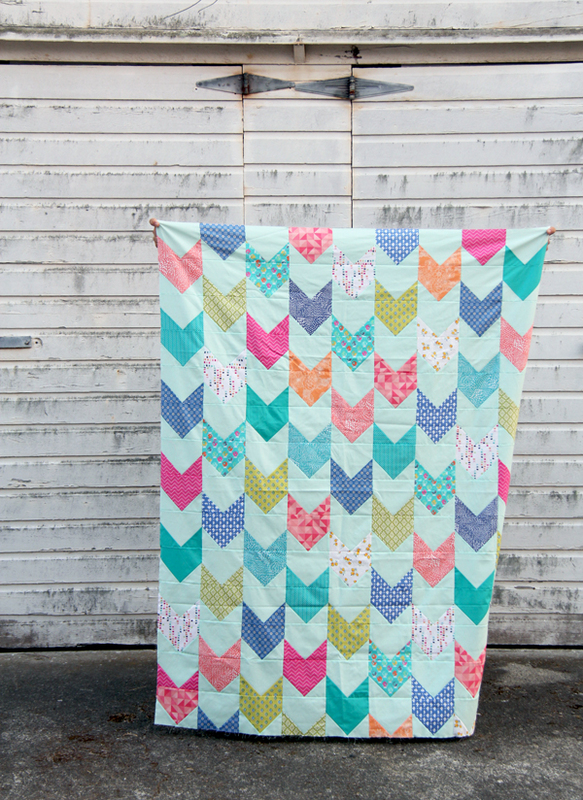 Back to the quilt…I finished my One Way quilt I made last fall! This globe fabric by Erin McMorris is one of my favorite prints of last year. Kaitlyn did the quilting, and I backed it with my lemons print from my line Hello Jane for Windham Fabrics, the binding is also from that line. The pattern is One Way in the Throw size, and the fabrics are a big mesh of prints pulled to match the globe print. 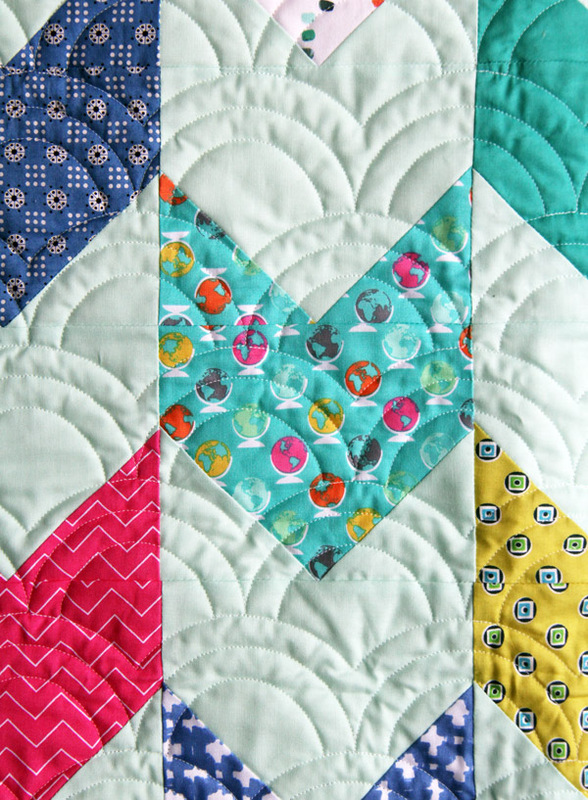 I’m loving this quilt in my living room…and having finished a quilt that I made just for fun! Hello Allison! 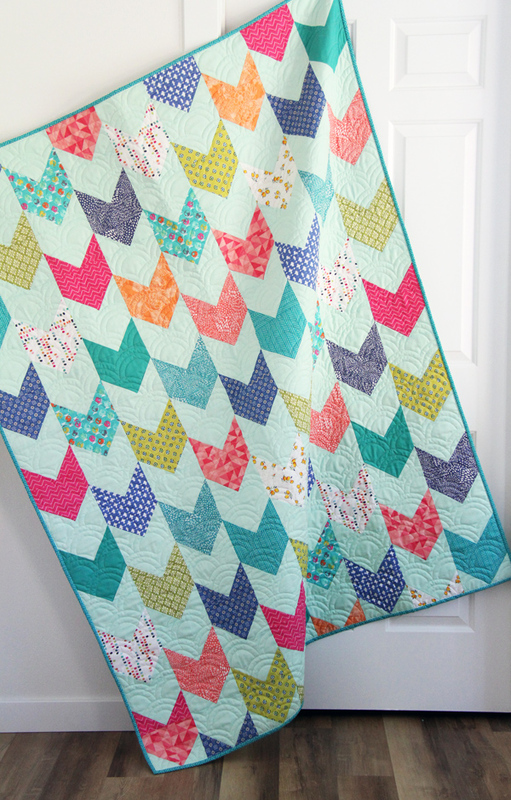 I truly love the fabric you used in this lovely quilt! In the pictures you have shared of it, my favorite is of it laying on the grey table. It just looks so natural there to me, plus, it really brings out the gorgeous bright fabrics you used. Oh and yes, you will miss all of the little messy handprint in your house someday! Until the Grandkids come and you love them then. LOL. Thank you for sharing and have a fabulous evening! That background color is perfection!! It looks great – both the quilt and your newly painted white doors.. This is a lovely, cheerful quilt. 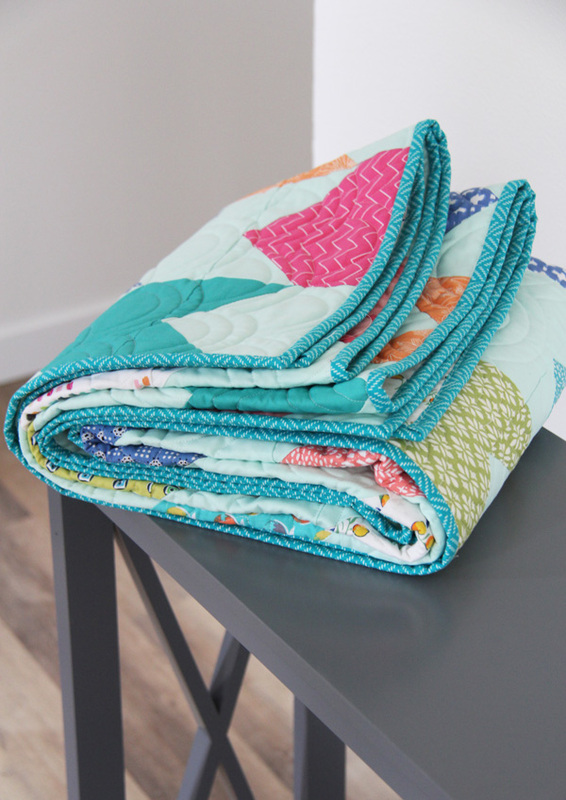 I love the fabric collection – especially the binding. 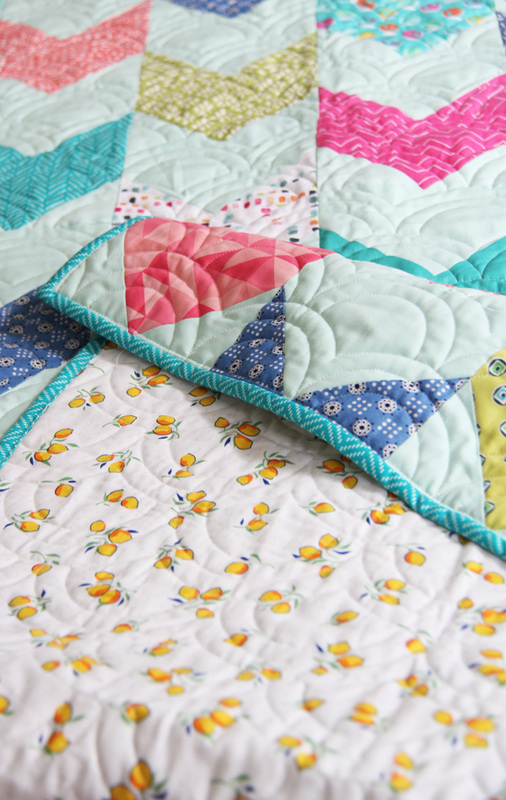 Your quilt is so bright and cheerful, I love the adorable backing fabric! Your doors are bright and cheerful, too! I love the aqua background. And that lemon print is great!! What color/fabric is the light aqua you used for the background? I’ve been thinking of this color as the background for my Village quilt but haven’t found the right one yet… This looks perfect! And I love your One Way pattern – I have one in the works for my daughter. The color is called Ice Frappe, and it’s a Kona cotton. My favorite color! Love your quilts, Allison. Have purchased a number of them. This one is next on my list to cut out. Thanks for sharing your talent. I am appreciated sharing your talents. You are a valuable lady. Allison, did you quilt this yourself or have it quilted? I am trying to find the quilting pattern. Love it! 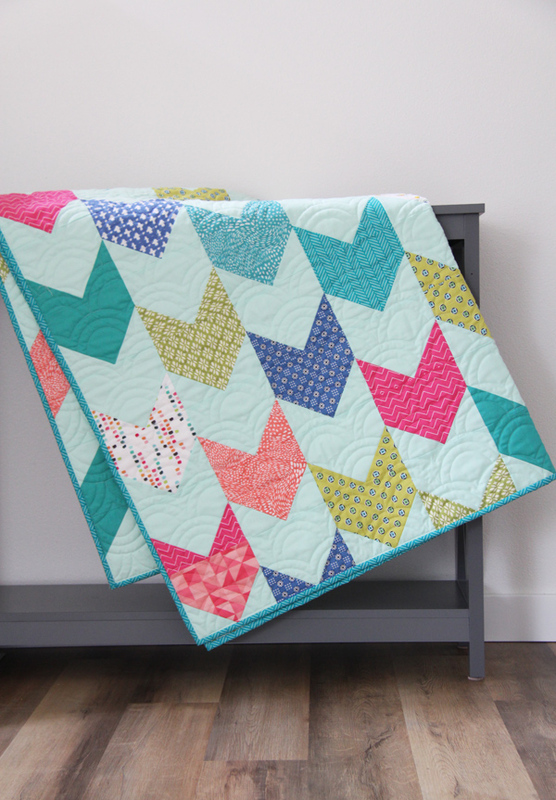 I had this one quilted by Kaitlyn at knotandthreaddesign dot com I’m not sure of the quilting design!